The 11th annual First Watch Sarasota Half Marathon & Relay has officially sold out! This is one of our favorite half marathons to run and has some of the best bling I've seen. Even though it's sold out, you still have a chance to run by raising money for St. Jude Children’s Research Hospital. By lending a helping and financial hand to St. Jude, runners and walkers not only gain entry into Sarasota’s longest running half marathon but most importantly help St. Jude lead the way the world understands, treats and defeats childhood cancer and other life threatening diseases, of which Sarasota families also benefit. Organizers have set an initial goal of raising $50,000 from the 2016 First Watch Sarasota Half Marathon, working to build awareness of the program and then doubling this amount to $100K in 2017. A total of 100 spots have been set aside from the sold-out race to allow runners and walkers (with a 4-hour course limit) to still participate and confirm their spot by lending a helping and financial hand to one of the region and country’s most important research medical facilities. 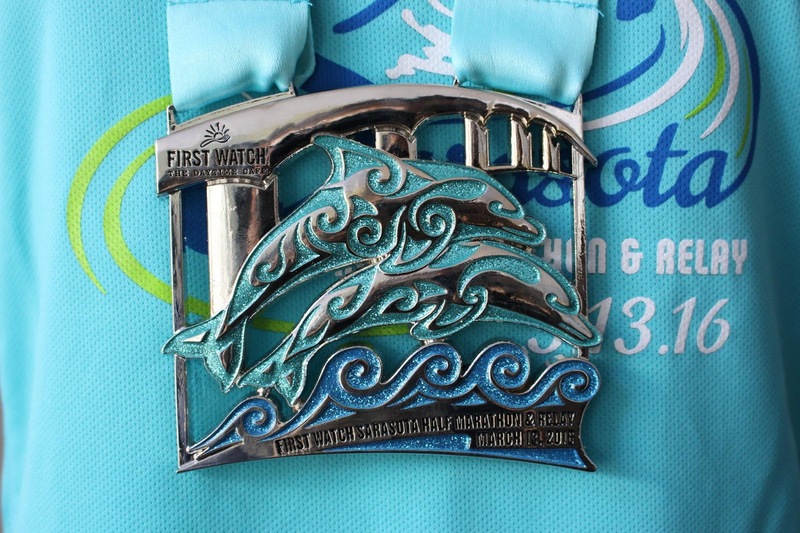 The First Watch Sarasota Half Marathon charity partnership capitalizes on the successful relationship that already exists between Life Time℠, producers of the First Watch Sarasota Half Marathon, and St. Jude via the South Beach Triathlon, where more than $1.5 million has been raised over the past five years. The partners hope to replicate the impact in Sarasota over the next several years. To better accommodate residents, minimize traffic delays and provide the optimal scenic course route for runners and walkers, organizers have altered the second half of the course to turn at Indian Beach Drive off US41 and do a loop to the Ringling Museum and back along Bay Shore Road. The course previously went up North Tamiami Trail/US 41 all the way to the Ringling Museum before turning to come back via Bay Shore Road. The first half of the course, starting at Van Wezel Performing Arts Hall, over the John Ringling Bridge and around St. Armand’s then back to the Relay Exchange at 6.2 miles remains the same. The two-person relay consists of two segments, the first being 6.2 miles from Van Wezel to St. Armand’s and then back to the exchange area outside Van Wezel. The next relay team leg covers 7.6 miles to the John & Mable Ringling Museum of Art and then back to Van Wezel, where teammates meet each other at the exchange area to head to and cross the finish line together. Wed., March 9 -- Miami Fit2Run Dadeland Mall, 12 to 6 p.m.
Fri., March 11 -- University Town Center Fit2Run, 12 to 7 p.m. Sat., March 12 -- Downtown Sarasota Fit2 Run, 10 a.m. to 5 p.m. Sun., March 13 – Van Wezel Performing Arts Hall (Race Start/Finish), 5:30 to 6:30 a.m.